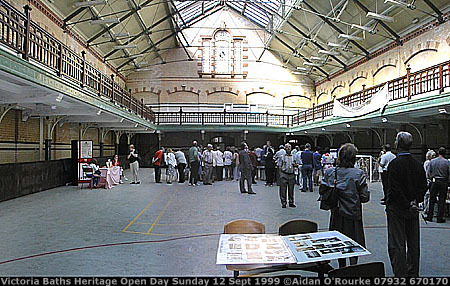 IT'S HERITAGE OPEN DAY WEEKEND when all over the UK, interesting buildings normally closed to the public are opened to visitors. I went to Gorton Monastery and Victoria Baths, two sites of great importance to Manchester which were closed to financial and social problems. Two separate campaigns aim to restore and re-open them within the next few years. This weekend people had a rare opportunity to see these familiar but run-down buildings from the inside, and thousands came. ENTERING THE MONASTERY OF ST FRANCIS, we pass through a derelict courtyard, overgrown with weeds. Signs have been put up warning visitors to take care. We walk along the cloisters, now dark and dingy: The windows are broken, light spills in from gaps in the roof and paint is coming off the walls. 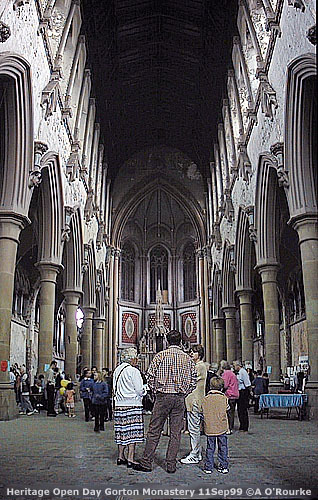 We reach the church and walking into the high, open space, we have the feeling of entering a cathedral. We are struck by the damage and decay the building has suffered. 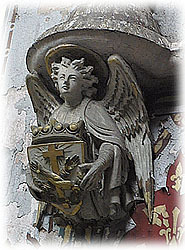 Stained glass windows are smashed, the paint is split and peeling, statues are broken and the large pieces are missing from the main altar. Despite the sorry state of the interior, this church is, in its own way, as impressive as York Minster or St Paul's Cathedral. It may not be as big, or as well-located, and opinions are mixed on the merits of the exterior design - but these factors make it all the more valuable. It stands in an unlikely location - close to former steelworks, railway goods yards and coal mines - all now closed. It was built for the Franciscan Order, who came here to found a friary and provide religious care for the surrounding community. 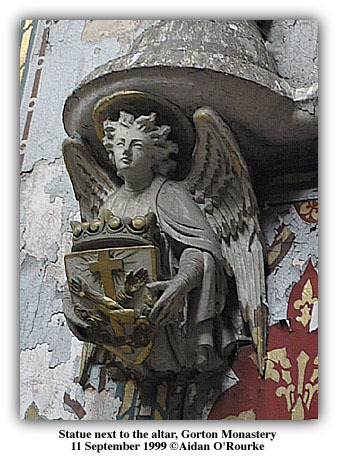 The church and friary were designed by Edward Welby Pugin, and the final wing was completed in 1867. For over a century, the church played a central role in the life of Gorton, but the post-war years brought change, much of it for the worse. By 1985, the monks could no longer afford to keep the place open, it was de-consecreated and sold to a developer. There was a plan to convert it into flats, but the developer went bust. 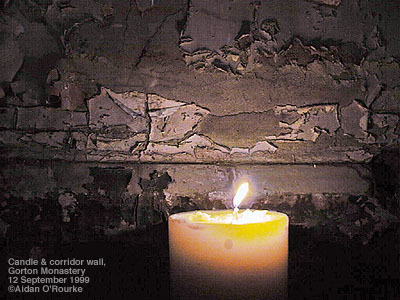 Now ownerless, the monastery fell victim to vandalism and decay. 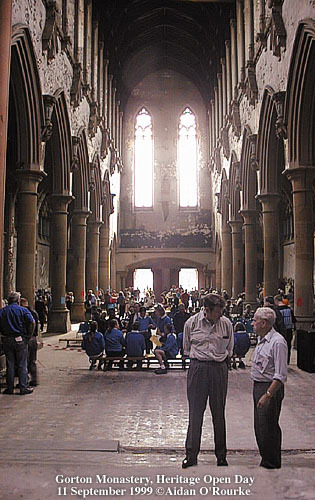 In 1996 volunteers set up the Monastery of St Francis & Gorton Trust with the aim of saving the buildings. Recently their efforts paid off when the Monastery was accorded World Monuments Fund Listing on the 100 most endangered sites in the world, along with the Taj Mahal and .Pompeii. Trust Chairman Elaine Griffiths told me they hope to have the building re-opened in time for the Commonwealth Games in 2002. This weekend, the church is full of visitors. 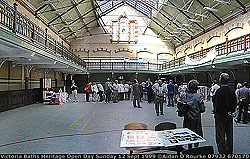 Picture displays and tables have have been set up by The Gorton Local History Group, (part of MANCAT - Manchester College of Arts and Technology). Displaying their books are Jill Cronin and Cliff Hayes, both leading local history authors. 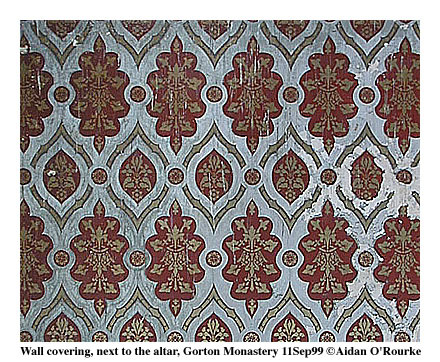 Trust itself has an exhibition of pictures showing the history of the Monastery. The girls of Spurey Hey School Choir are singing songs - not quite the choir of Chetham's School of Music, but it's good that local childrens' voices are heard echoing through the building once more. On Sunday 3pm there was a celebration with music and words - not a religious celebration it was stressed - in today's climate of apathy towards religion on the one hand, and multi-culturalism on the other, faith is an extremely delicate subject. The exact post-millennium role of this site hasn't yet been decided, but one thing is for certain, it won't be a church. One of its uses will be "Spirit of Life - the Centre for the Celebration of Humanity", if I understand it correctly, a multi-cultural, multi-faith educational and tourist venue. 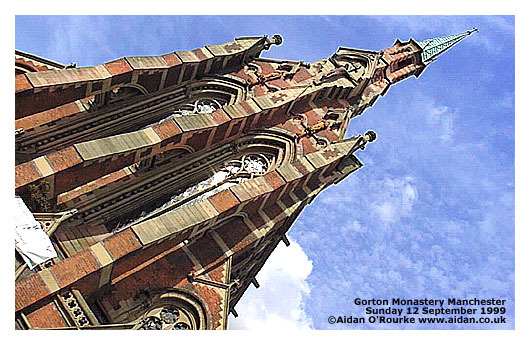 More details of Gorton Monastery are on the website (online soon address below), run courtesy of Mancat. It was planned to have classic buses running between the Monastery, the Baths and the Transport Museum, but in the event, they only ran to the Monastery, so I covered the next bit by car. by writers Jill Cronin and Frank Rhodes. 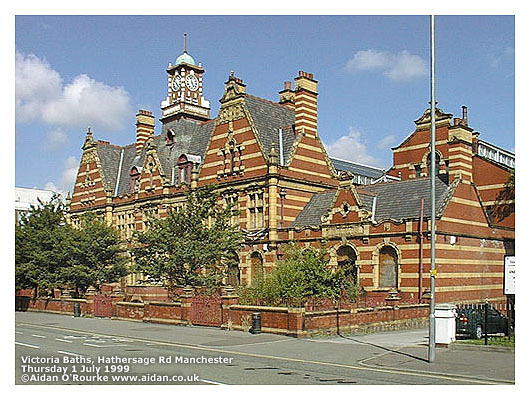 SITUATED IN CHORLTON-ON-MEDLOCK, not far from Manchester Royal Infirmary, the Victoria Baths are one of Manchester's most historic and beautiful buildings. They were opened in 1906 on what was then High Street, providing some of the best bathing, washing and laundry facilities in the country. On the exterior you can still read the signs for the separate entrances: males - first class, males second class and females. An artesian well provided the water, which was cleaned and pumped first into the males first class pool. It was then recycled for the second class male pool, finishing up in the female pool. Today we find this amusing, but by the standards of the day, it was progressive to offer any kind of female bathing facility. By the 1930's, mixed bathing was introduced, allowing fathers to teach their daughters to swim. In the 40's, the main pool was often covered over and used as a dance hall - it's said that many wartime romances started here. In 1952, an aerotone machine was installed, a fearful looking stainless steel metal basin thing that treats its single occupant with an envigorating dose of swirling air and water. Over the course of time, High Street became Hathersage Road, and the local area declined in prestige. In the 60's and 70's, my school, Xaverian College, held swimming galas here (pronounced by Mr Baccus as "gayla"), though I never went myself. Not so long ago, there wasn't much respect for things considered "old fashioned" and repairs were done on a shoestring budget: old tiles were hidden by tacky wall coverings, original taps were thrown away and replaced. But luckily, the fabric of the building survived and 80 plus years on, the Baths were still in daily use, but the end was just around the corner. 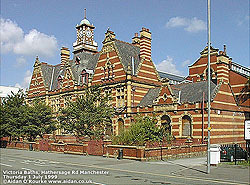 The Victoria Baths, proudly opened by Manchester Corporation in the first decade of the 20th century, were shut down by Manchester City Council in the last. They blamed a shortage of funding caused by Conservative cuts. It's easy to accuse Manchester City Council of neglect, but I say it's down to deep social problems in our society, exacerbated the city boundaries, which exclude wealthier council tax payers from the City council tax rolls. 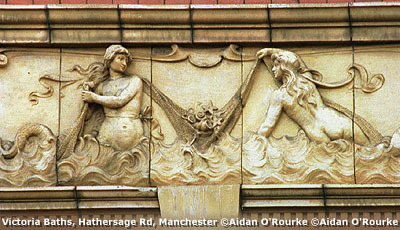 Since then The Victoria Baths Partnership was formed with the aim of re-opening the building. The Friends of Victoria Baths have drawn up a business plan: Seven and a half million pounds will have bo be raised, some of it hopefully from Lottery money. Things have never looked better, and if all goes to plan it will be open again by 2003. But it won't be just a plain old "swimming baths". Today's complex social and political climate demands a more innovative approach, especially when trying to secure grant funding: The baths will become a "Healthy Living Centre" with special facilities for the disabled, giving equality of access to all users and promoting overall health and well-being. IF THIS BUILDING WERE IN HARROGATE, Bath, Stuttgart or Budapest, I'm sure it would never have been closed. Over the last 6 years, vandals, thieves and pigeons have degraded the building. The rot had already set in long before closure: the cast iron changing cubicles show years of corrosion, as do the metal roof struts, which will have to be replaced. 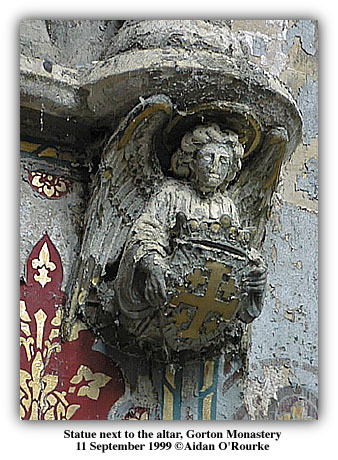 But despite the dirt, dust and bird droppings, certain parts look as if they were put in yesterday, particularly the green wall tiles and the Manchester Corporation coat of arms. 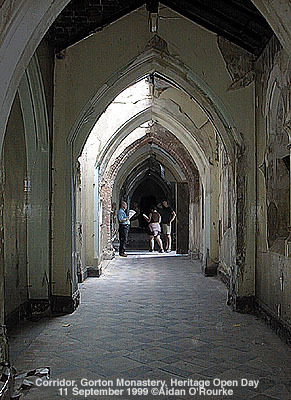 The middle hall, formerly for males, second class, was covered over for dry sports - it's proposed to keep this hall like this. The female pool will probably be used as a training pool once again. The Turkish and Russian baths, with their beautiful light green ornamented enamel tiles, look almost like new. 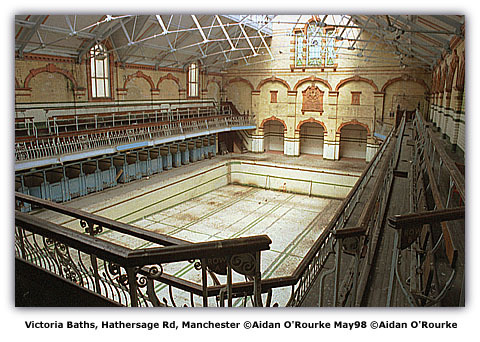 I plan to be there when the pools are filled with water and the steam rooms are steamed up once more. In the meantime, I'll be following the progress of the renovation, and taking more photographs. OTHER NEWS ITEMS include the funeral today of firefighter Paul Metcalf who lost his life while trying to save a boy who also drowned. THERE WAS A POP CONCERT YESTERDAY in Heaton Park - it was organised by BBC Radio 1, and hundreds of free tickets were given out. An enormous tent was put up, in which a succession of bands gave their performances, broadcast live on radio, with edited highlights later on tv. My favourites were the all-girl foursome All Saints, whose baggy trousers and scruffy T shirts looked like they were bought at Affleck's Palace. The peformance was held up when three yobbos climbed up one of the tent supports. Mel C, (ex of the Spice Girls) had bottles thrown at her. Travis, Supergrass and Manchester band James were also on the bill. We left early, and in the dark open field outside, we noticed that thugs had attempted to storm the outer fence. Riot police were out in force, and the GM police helicopter hovered overhead like a UFO, shining a single spotlight down onto the grass. 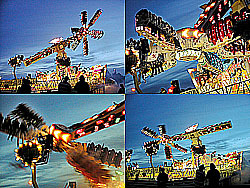 Sneering, shaven-headed, youths were silhouetted against the light - I felt a frisson of danger as we walked back to the car, but we were OK.
LIVERPOOL will be the venue for this year's upcoming In The City festival, taking place later this month. I'll also be doing a special "Ship Canal Cruise" and "Liverpool City Centre" newsletters in the coming weeks, with lots of photos and some QTVR panoramas. GREATER MANCHESTER POLICE are to get a new helicopter - the present one has helped in many incidents, from festival crowd control to car chases, securing hundreds of arrests. The new one will be able to take off immediately, gaining valuable seconds during crime incidents. A FESTIVAL TOOK PLACE IN CASTLEFIELD yesterday - I was fully booked and couldn't make it. Another one coming up is the Food and Drink festival - so many events, so little time! Well, it's a mild night here in Manchester - and good weather is again forecast for later in the week. This summer has certainly been warm and sunny and it's not over yet! Drop in later in the week for more pictures and reports from Manchester.